Every year, hundreds of students across the nation enter Screen It – The Australian Centre of the Moving Image’s (ACMI’s) epic moving image competition for Primary and Secondary school students. Screen It is designed to educate, encourage and foster the next generation of young moving image makers. It’s fun and, best of all, it’s free! 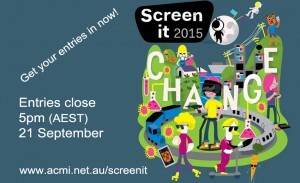 Screen It 2015. Entries close this Monday – 5pm (AEST) 21 September.